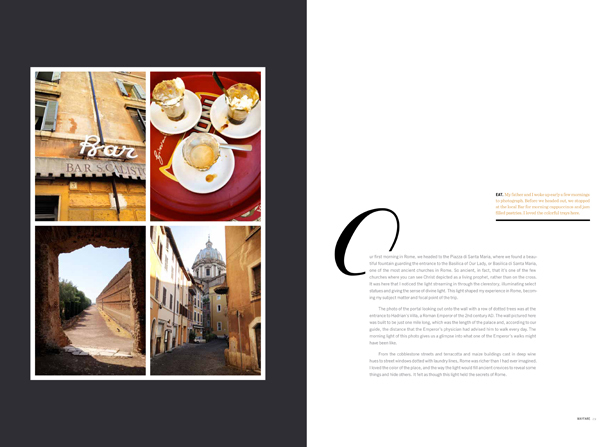 Leigh Beisch Photography Blog: Wayfare Magazine includes my photos from Rome in their first printed edition to be sold at Anthropologie. 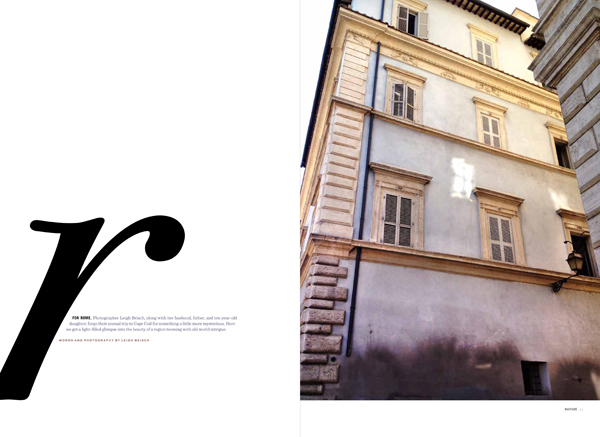 Wayfare Magazine includes my photos from Rome in their first printed edition to be sold at Anthropologie. What was nice about this request was that it wasn't really an assignment. She wanted to see the photos that I would take for myself, she was especially interested in seeing what I shot for my personal series of work entitled "Bodies of Land" which is comprised of out of focus landscapes, or in this case cityscape's. I also played a lot with Instagram for this trip since I liked the format, the accessibility to capture things at any time and the tones that were rendered with some of the filters. I am usually not a big "effects" photographer, nor do I like a lot of retouching. I liken the filters to using different types of film or printer paper. daughter, forgo their annual trip to Cape Cod for something a little more mysterious. 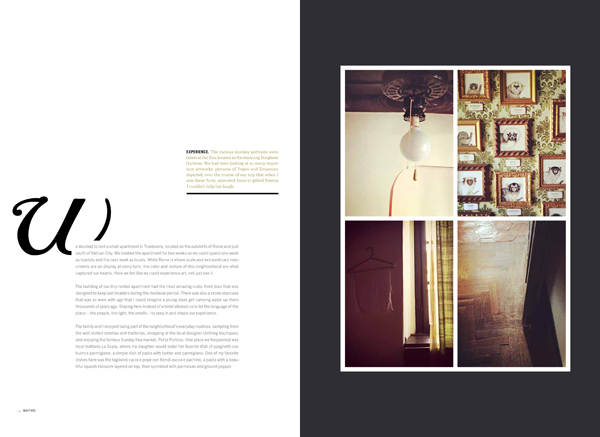 Here we get a light-filled glimpse into the beauty of a region teeming with old world intrigue. We decided to rent a small apartment in Trastevere, located on the outskirts of Rome and just south of Vatican City. We booked the apartment for two weeks so we could spend one week as tourists and the next week as locals. While Rome is where scale and extraordinary monuments are on display at every turn, the color and texture of this neighborhood are what captured our hearts. Here we felt like we could experience art, not just see it. The building of our tiny rented apartment had the most amazing rustic front door that was designed to keep out invaders during the medieval period. There was also a stone staircase that was so worn with age that I could imagine a young slave girl carrying water up them thousands of years ago. Staying here instead of a hotel allowed us to let the language of the place—the people, the light, the smells—to seep in and shape our experience. The family and I enjoyed being part of the neighborhood’s everyday routines, sampling from the well-visited osterias and trattorias; shopping at the local designer clothing boutiques; and enjoying the famous Sunday flea market, Porta Portese. One place we frequented was local trattoria La Scala, where my daughter would order her favorite dish of spaghetti con burro e parmigiano, a simple dish of pasta with butter and parmigiano. One of my favorite dishes here was the tagliolini cacio e pepe con fioridi zucca e pachino, a pasta with a beautiful squash blossom layered on top, then sprinkled with parmesan and ground pepper. timeless landscape that captures the imagination. Our first morning in Rome, we headed to the Piazza di Santa Maria, where we found a beautiful fountain guarding the entrance to the Basilica of Our Lady, or Basilica di Santa Maria, one of the most ancient churches in Rome. So ancient, in fact, that it’s one of the few churches where you can see Christ depicted as a living prophet, rather than on the cross. It was here that I noticed the light streaming in through the clerestory, illuminating select statues and giving the sense of divine light. 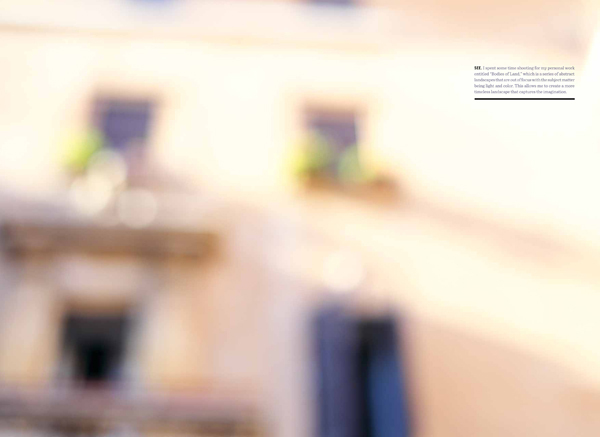 This light shaped my experience in Rome, becoming my subject matter and focal point of the trip. The photo of the portal looking out onto the wall with a row of dotted trees was at the entrance to Hadrian’s Villa, a Roman Emperor of the 2nd century AD. The wall pictured here was built to be just one mile long, which was the length of the palace and, according to our guide, the distance that the Emperor’s physician had advised him to walk every day. The morning light of this photo gives us a glimpse into what one of the Emperor’s walks might have been like. From the cobblestone streets and terracotta and maize buildings cast in deep wine hues to street windows dotted with laundry lines, Rome was richer than I had ever imagined. I loved the color of the place, and the way the light would fill ancient crevices to reveal some things and hide others. It felt as though this light held the secrets of Rome.